Announcement Stouffer Pottery encompasses a broad range of ceramics from decorative pieces to utilitarian wares including both hand built and wheel thrown pottery. 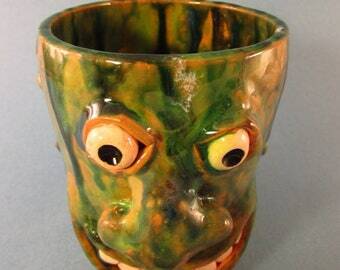 Literally anything ceramic can be found from face jugs and animal sculptures to functional clay whistles and coffee mugs. If you can't find it, custom orders can be made as well. Stouffer Pottery encompasses a broad range of ceramics from decorative pieces to utilitarian wares including both hand built and wheel thrown pottery. 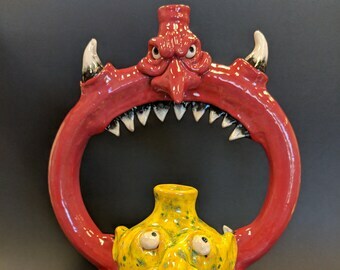 Literally anything ceramic can be found from face jugs and animal sculptures to functional clay whistles and coffee mugs. If you can't find it, custom orders can be made as well. Arrived in one piece and has fun colors. My son loved it. Jody's color choices and the folk art style of his pieces are really special. I was excited to display his art in my home. I can't wait to see new work.